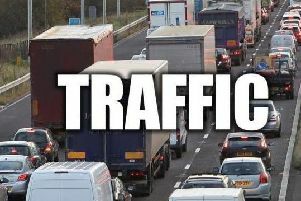 A lane has been closed on the M62 near Ferrybridge this morning after a crash. Shortly after 8am, Highways England said that lane one between junction 33 at Ferrybridge and junction 32 at Holmfield, on the westbound carriageway, was closed. Traffic officers were at the scene and the agency, which posted the news from its official Twitter feed, advised drivers to take care in the area. It said: "M62 Westbound Between J33 #FerryBridge and J32 #Holmfield there is currently a lane 1 closure in place for a RTC. @WYP_RPU and #TrafficOfficers are on scene and dealing. Take extra care when travelling in the area." M62 near Ferrybridge. Pic: Google.